After purging a ton of Holiday stuff following the undecorating of Christmas, I discovered I had little to none in the way of Valentine’s Day decor. Being the frugal mama that I am, I was inspired by ombre yarn wrapped letters I had previously seen on Pinterest (seen here) and decided to concoct my own DIY Valentine’s vase. I also happen to love love love fresh flowers. And specifically tulips. 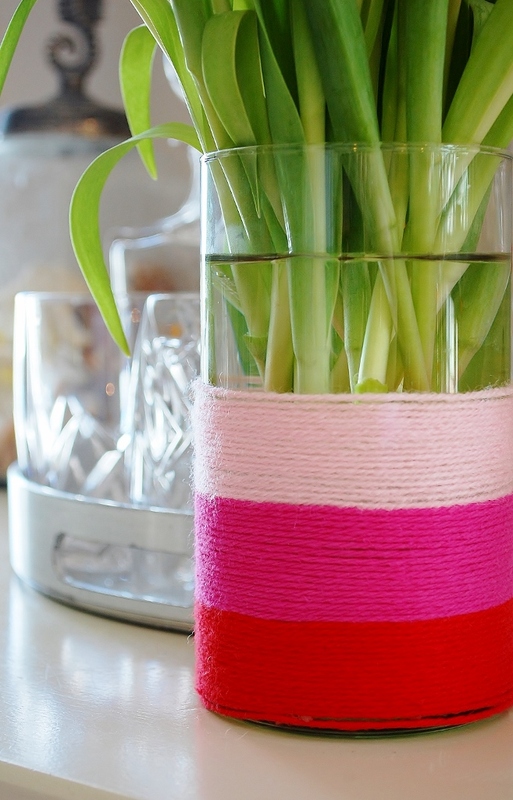 What better excuse to splurge on a few to showcase in my cute little yarn wrapped Valentine’s vase? I mean, come on. 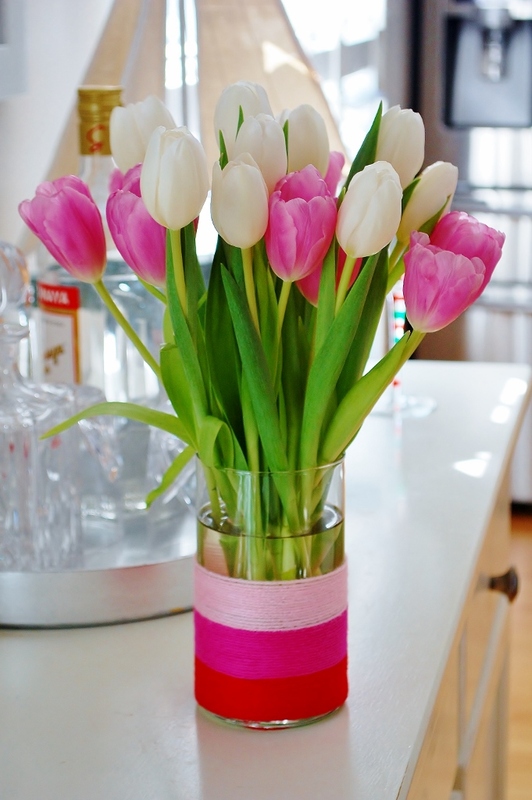 How can you NOT love tulips? It makes me a bit cranky that I can’t grow them in our “state” of perpetual heat. Oh, how I’d love to live up north. Just for the flowers. This idea of wrapping my older than dirt, inexpensive clear glass vases is a new little obsession of mine. I also considered using the twine wrapped vase from my Fall/Thanksgiving post and adding a little pink or red ribbon or even a heart to it for a more rustic look. But in the end, I opted for a more festive look. 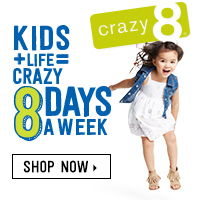 Kind of odd for me, no? Oh well. So that’s it. 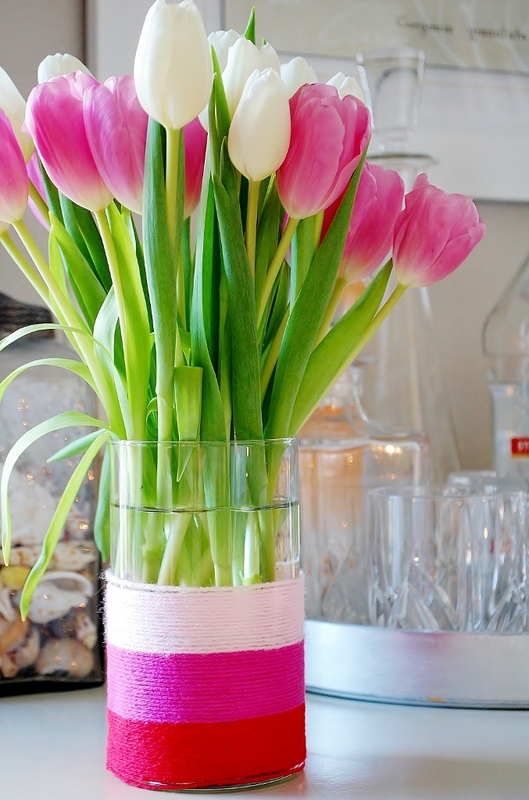 An easy peasy DIY idea to add a little looove to your existing decor during Valentine’s Day. Wow that turned out so beautiful! And I LOVE tulips! I love the color combination. And something about fresh flowers that just brightens up the entire house! I agree! Fresh flowers make me SO happy! I have a friend that used to joke about her husband only ever bringing her “grocery store” flowers and I was like WHAAT!???!?! Those are the best!!! 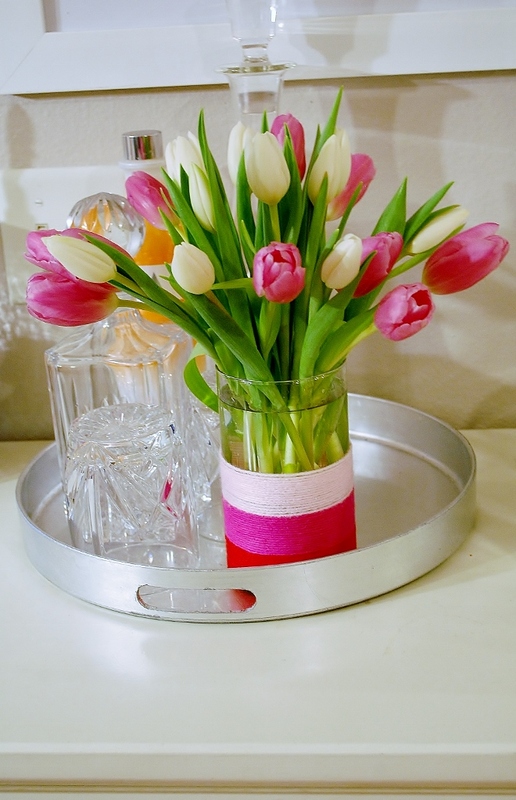 You don’t spend a zillion dollars on them and they are amazing in your own, hand-picked vase!! !